It takes a surprising amount of planning and coordination when photographing a marriage proposal, particularly when there is no opportunity to meet with the groom-to-be beforehand and scope out the location together. In this instance, it took place at beautiful Oak Alley Plantation in Vacherie, Louisiana, where Joe had taken Whitney to go on the guided tour of the graceful and historic home (of course, he had bigger plans). While they were on the tour, I had to determine the best spot on the long walkway for the proposal to take place, taking into consideration the overall composition and, more importantly, how the light was at that particular moment. I then had to secretly communicate this spot to Joe by text message, using a prearranged code so that Whitney would not be suspicious if she happened to glance at his phone when the message came in. Lastly, in this kind of situation I usually pretend to be taking pictures of the 300 year old oak trees, the house, or other scenery so that the presence of a photographer would not prematurely clue her in as to what was about to happen, and at such a frequently photographed landmark such as this, it's certainly not out of the ordinary for photographers to be set up along this walkway. But in this case, in an improvised moment, I pretended to be photographing an engagement portrait of another couple who happened to be nearby. 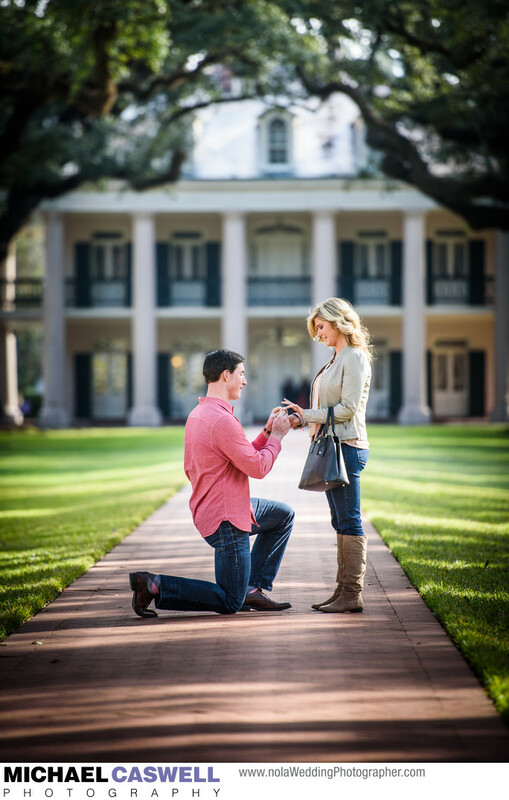 In the end, it all worked out absolutely perfectly, the special moment was captured in a series of gorgeous images, and we finished off with an engagement portrait on the beautiful grounds of the plantation.